Oh, man, do you need some kind of ride? Most people (but not all) appreciate my efforts. So clearly I love music. I know I wrote that at the beginning, but by repeating that, I hope you’ll realize how much I love music. There—that was a third time. Somebody stop me! The point to all this chatter about how much I love music (fourth time) is that this year, I am not going to listen to secular Christmas songs. In other years, I would have listened to some of my favorite songs like “Believe,” “Little Saint Nick” and “The Peace Carol,” but not this year. Why this sudden change? Why religious songs and not the secular ones? Have I suddenly become a zealot who wants to burn all the Ray Conniff Christmas albums or stop people on the street to educate them about the creeping evil of secularism? I’m just not in the mood. My father spent most of 2014 in doctors’ offices and died of multiple organ failure in January. I received 49 radiation treatments for cancer in 2013 (the treatment was successful, thank God) and dealt with a number of side effects. Mass shootings and acts of terrorism dominated the media. I know, people suffer and die every year, sometimes in horrible ways. What’s the difference this year? I don’t know. I have simply reached a tipping point and don’t want to hear about how Rudolph the Red Nosed Reindeer saved the day. Please don’t call me up to recommend a psychiatrist or offer some medication. I appreciate it, but I’m in as good a mood as I can be. And please don’t quote scripture at me. I’m no theologian, but I am Baptist and have studied the Bible for about 63 years. (We start early and don’t quit.) One horrible year, I recounted all the bad things that happened and ended by saying the next year had to be better, and it was. Some helpful soul wrote an email reminding me of Paul’s admonition to give thanks in all circumstances. In the first place, I was aware of the verse. In the second, Paul did not tell us to be happy when we’re in prison or bitten by a snake but rather to realize that God is still with us and cares for us. I believe this even though I won’t sing about jolly old Saint Nicholas this year. The title of this piece refers to the Grinch, and I ask you, Who’s the Grinch? Is it I? Is it disease or war or terrorism or starvation or suffering? Or is it the overblown celebration of the birth of a simple peasant baby? It’s up to you. You decide. 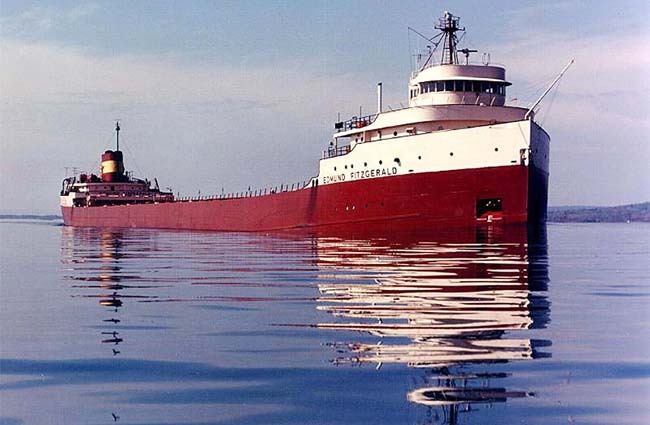 Forty years ago this past Tuesday, the ore carrier Edmund Fitzgerald sank without warning in a monster storm on Lake Superior. Moments before they dropped off radar, the captain reported “We’re holding our own,” the freighter sank with the loss of 29 souls, the entire crew. Initially, authorities thought that the ship sank because the crew failed to properly secure the huge hatches on the main deck. Families objected, saying the captain and crew were far too conscientious to have left such an important task undone. Later analysis showed that the carrier probably encountered “rogue waves,” two exceptionally large formations in a row that appeared without warning. One wave lifted the Fitz from the bow while another hoisted the stern, leaving the hull between bearing the entire weight of the cargo. The ship broke in two and plummeted to the bottom, taking crew and cargo with it. Lightfoot changed the lyrics to his song to reflect this new reality. The song later went on to receive considerable airplay at the time, unusual for a ballad that ran over eight minutes. I think that Lightfoot portrays the danger of plying the waters and the courage of the mariners. His creation of a work that recognizes both and honors the sacrifice of so many brave men stands as a testament to human perseverance and creativity. In spite of risk, we as humans continue to dare the elements and as we do, we have the poets and writers among us to record those stories. I can’t think of a more potent combination. ‘Cause there ain’t no one for to give you no fame. I have several questions about this: what in the world is anyone doing in a desert on a horse, named or no? And how much rain would you have to endure to relish being in a place where daytime temperatures reach upwards of 120 degree Fahrenheit with little water in sight? Do the extreme temperatures cause you to forget your name and why should you need fame to remember who you are? I don’t know the answers to these questions. I was hoping you would, so talk to me after we’re done and enlighten me as to these mysteries. 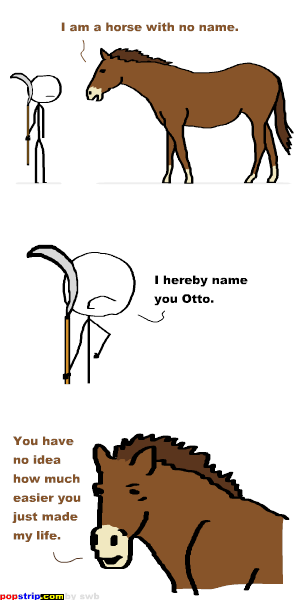 On a somewhat more serious note, our names are important to us. They give us an identity and may be a source of pride or aggravation depending on what they are and who we are. Parents agonize over what to name their babies and sometimes they don’t choose too wisely. One study found that a bad first name can not only ruin your self-esteem, but it may actually make you lonelier — and dumber. And no one wants that. Some actual names that might cause problems for a hapless girl are Audi, Chia, Hennessy, Merci, Monet, Nixon, Zeek, and Zuly. For boys, the names are Anthem, Denim, Dior, Hershey, Piers, Simba, Vino, Walden, and Zeppelin. Led or not, I don’t know. If you find yourself in the desert, I hope you have a horse, even if it doesn’t have a name, and I also hope your name isn’t one that causes problems, and most of all, I hope that you can remember your name. Good luck.